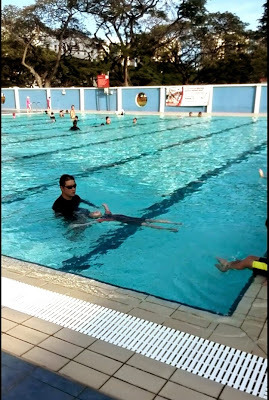 IZ started swimming lesson right after he turned 4. The first few months was predictable, given his timid character. He took a step forward.. two steps backward.. half step forward, a step backward.. back and forth.. until.. right after our Melbourne trip. 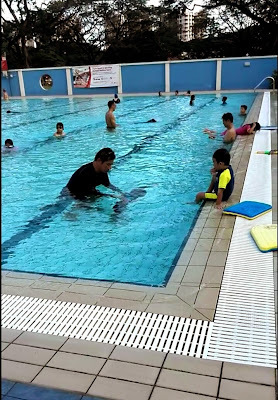 Not that we went swimming in Melbourne, he just some, like a light bulb suddenly lit up. He has never looked back since. He's been progressing, albeit slowly.. 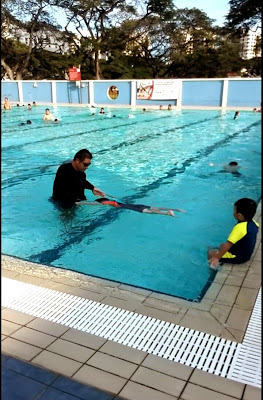 Teacher Victor is working on water safe stage.. get them accustomed to the water, able to float, able to paddle..